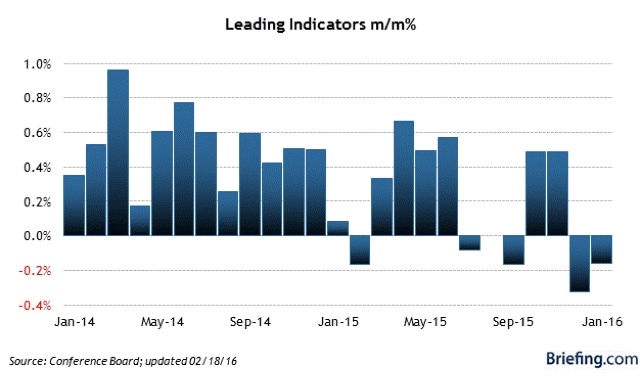 My Weekly Indicator post is up at XE.com . 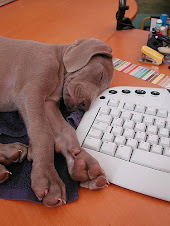 Several data series flipped this week. Most notably, Real M1 decelerated sharply. 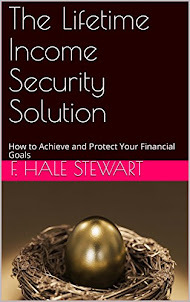 With this morning's report that consumer prices were unchanged in January, I can update several of my favorite series. Evidence that an intact consumer has continued. For comparision pursposes, this in only about 1% behind the 1980s Reagan recovery an equivalent number of months out from the 1982 bottom. So, continued good news on the worker and consumer side of the ledger. The other day I wrote that the current slowdown does not meet the definition of a recession. 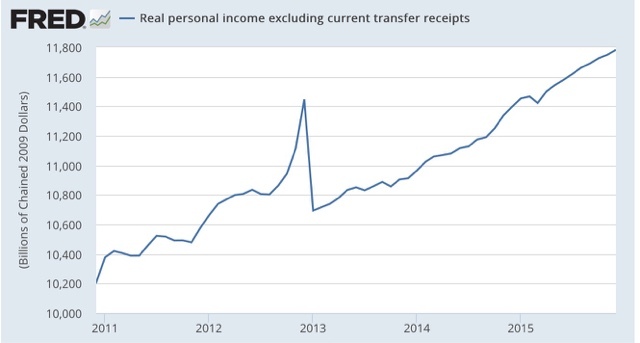 It is not a broad downturn in production, sales, income, and employment, but rather an intensely focused downturn in prodcution and sales in the commodity and export sectors, that has not spread to other manufacturing sectors, and not to consumers at all. I neglected to include a brief discussion of corporate profits. There is no doubt that corporate profits, in the aggregate, have declined over the last year. But it turns out that same division between energy sectors and everything else also applies. 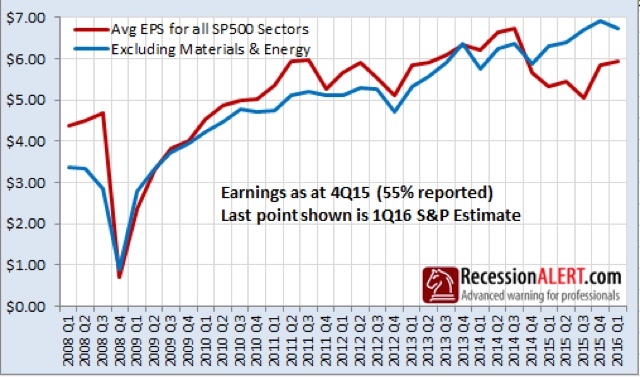 Ex-energy, S&P corporate profits improved through the 3rd quarter, with only a slight decline in the 4th quarter. 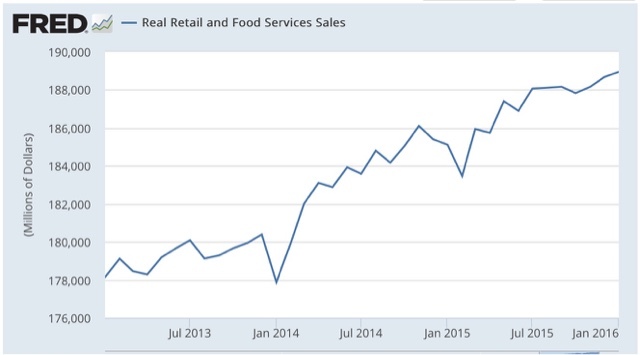 Profits in consumer sector have continued to increase. 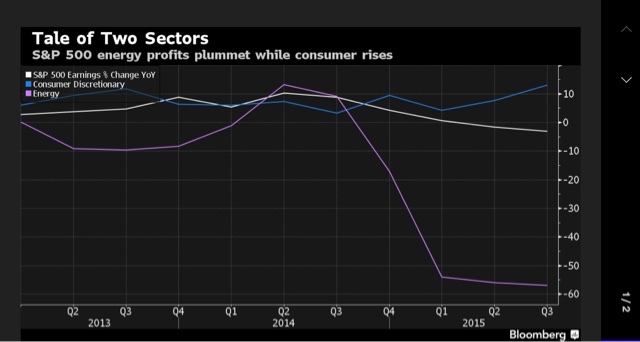 So corporate profits support the conclusion that this is an intense but narrowly focused downturn. 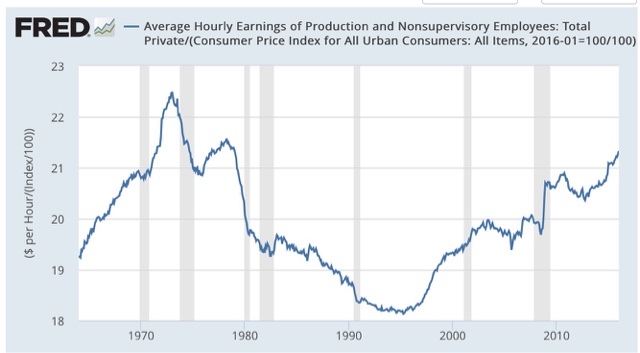 While this isn't good, if historical patterns hold, it is not consistent with a recession happening yet. 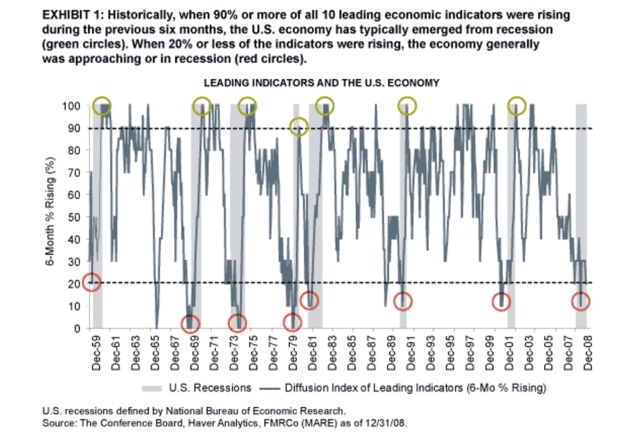 Between July of last year and January of this year, 5 of the 10 indicators fell. One was neutral, and 4 improved. At least two of the 5 declining indicators that fell (initial claims, which have improved in the last few weeks, and housing permits, which only suffered due to comparison with the June spike caused by NYC) look likely to flip positive on a 6 month basis this month. Incidentally, permits is the only series on the "consumer" side of the ledger to have declined. It is also worth noting that on the producer side of the ledger, "core capital goods orders" have been positive for the last 5 months, and although ISM new orders were scored negative, they actually showed slight growth in January. So while I don't want to sugarcoat what is after all a bad number, it still does not mean DOOOM! 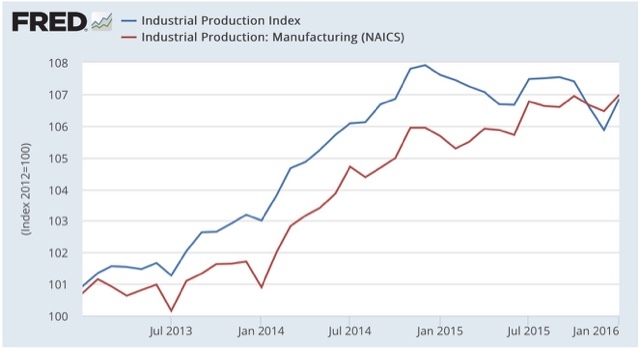 This morning's industrial production numbers clarify why the US economy is not in a recession. 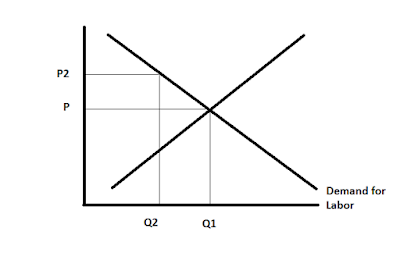 Although the rubric of two quarters of negative GDP is common, the NBER defines a recession as a widespread downturn in production, sales, income, and employment. This simple fact is, while our current slowdown might produce a negative GDP reading, it is simply not a widespread downturn. Let's begin with the consumer side of the economy, and then turn to the producer side. 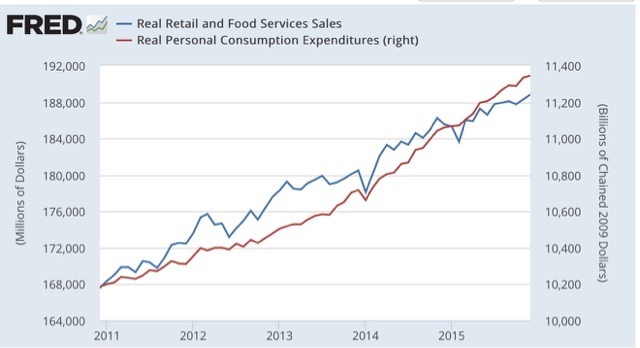 So, as I said last week, the consumer is alright. 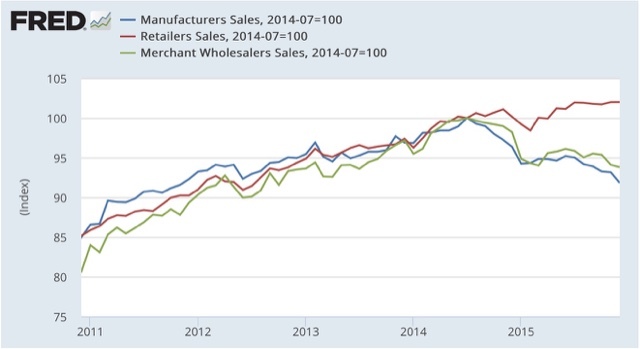 While manufacturing and wholesale sales are down, retailers sales are not. 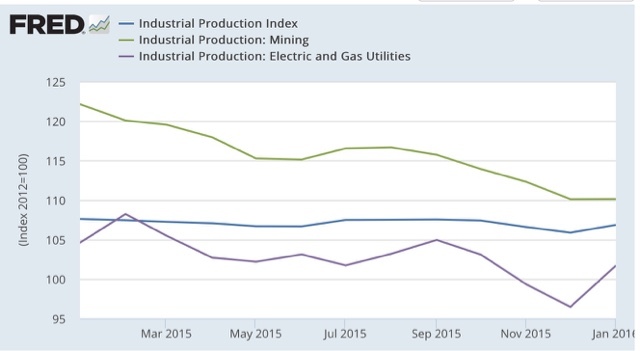 Although mining turned down a full year and a half ago, and utilities have suffered (in part because autumn and December east of the Mississippi remained unseasonably warm), manufacturing has continued to increase, tying its all time high in January. There has been an intense and focused severe downturn in the sector of the economy having to do with commodity extraction and exports. The rest of the economy has continued to improve. That's why the US is not in a recession. 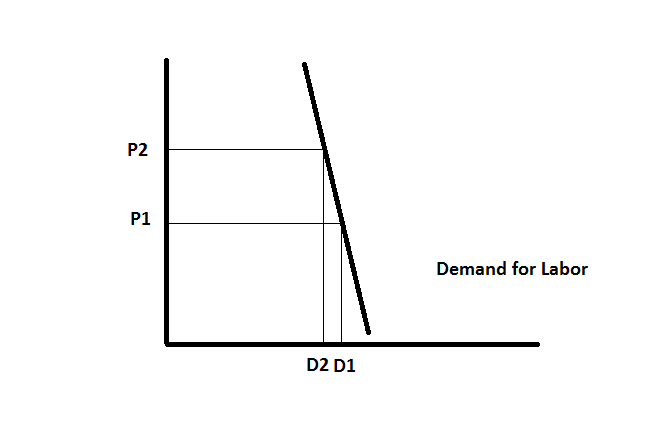 In the above chart, the government increases wages from P to P1 and demand drops from Q1-Q2. 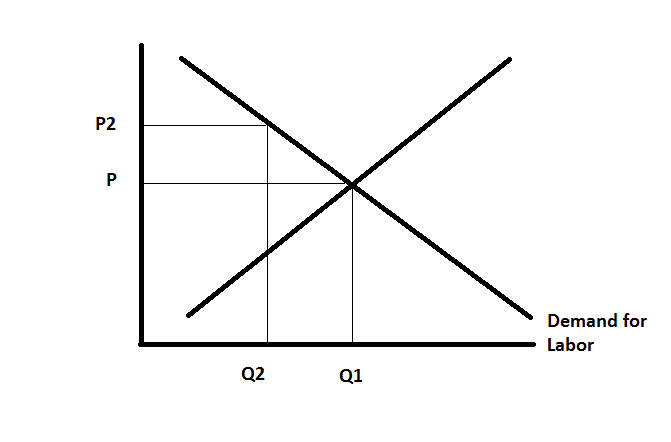 In this example, the line Q1-Q2 is longer than P-P1, meaning the increase in price had a large impact on demand. 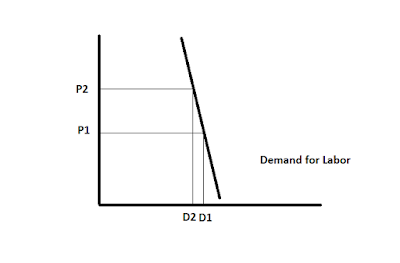 Above we see the quantity demanded decrease slightly relative to the larger increase in price. This means that even if wages increase, we still demand a certain amount of labor. The second chart is actually far more realistic. Consider the following fact pattern: a store currently has 100 employees. Because they're a profit maximizing entity, they are already using the optimal amount of labor (give or take say 5-7 employees). Let's assume they cut their workforce by 25% because of the increased wages they must now charge. At this level of cuts they'll see shelves stocked less frequently, fewer employees helping customers finding items and longer check-out lines. This will actually decrease their sales; customers will get tired of not being helped and will become frustrated with the longer lines. The horizontal line shows the total amount of labor while the vertical lines shows total output. 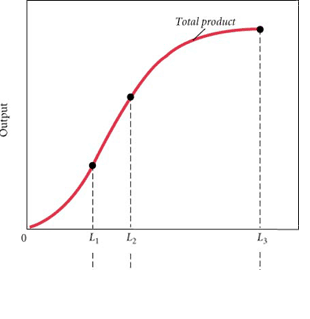 Notice that as L decreases, so does output. Thanks to Jared Bernstein for first pointing this out awhile ago. [UPDATE]: Alan Kreuger's research confirms. The big gas price decline of 1986. 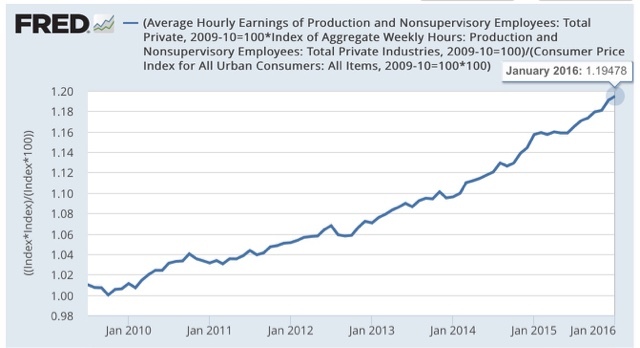 The JOLTS report is an extremely useful dissection of the labor market. Unfortunately it has only existed for 15 years, and thus includes only one full economic cycle, and so must be interpreted with caution. 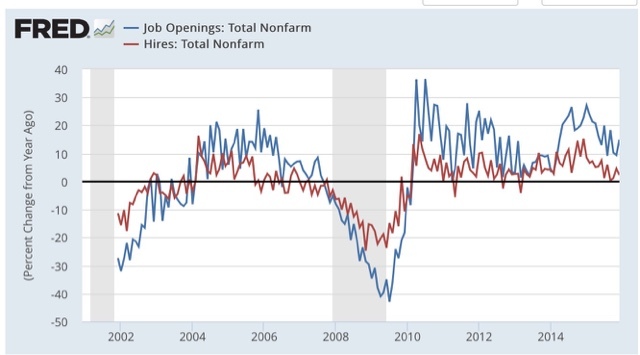 So the pattern - from one cycle - is: first, hires peak. Then, openings peak. 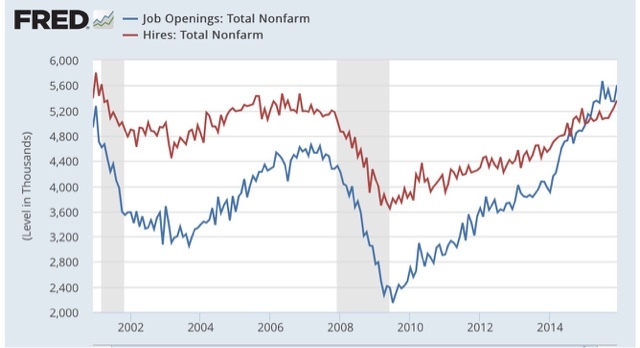 Openings have been rising faster than hires, which are have been barely positive. Until the last month, when hirest soared to a new all-time high, as shown in the first graph abpve at far right. This means that workers were confident enough in their prospects to voluntarily leave their jobs. Note that layoffs (green) remained low. 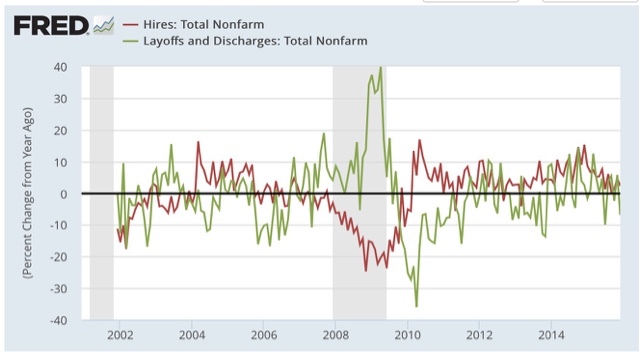 A similar pattern exists in the longer data series of jobs vs. initial jobless claims - job growth softens, then layoffs increase, before a recession begins. 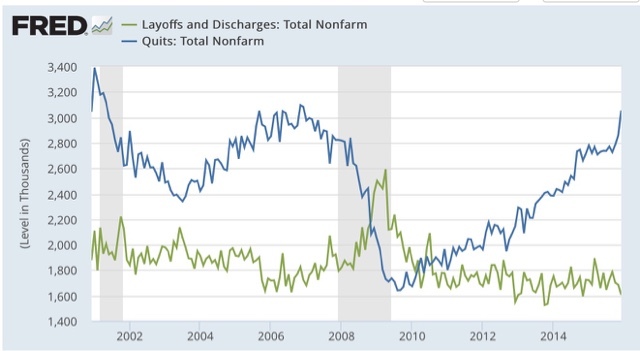 In the JOLTS series, layoffs have actually declined a little, and the big increase in hires is very positive. 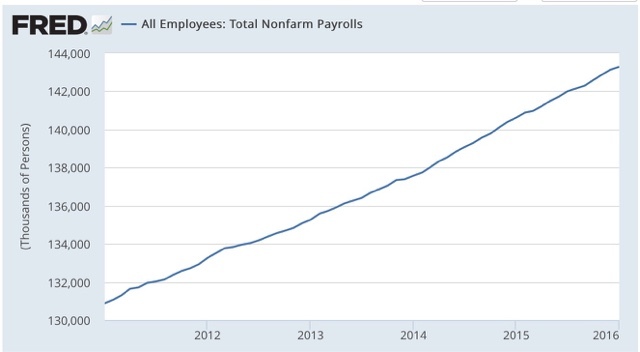 Finally, Dean Baker made a point that there is "pent up damend" for quits, and therefore they should continue to all time record highs. I started out thinking like a devil's advocate: after all, if there were "pent up demand" for quits, if, say, there were 2 people dissatisfied and looking to move for every 1 person similarly situated in the last business cycle, wouldn't at least *some* of those extra people quit when the U6 rate were 11% and 12%, instead of all waiting until U6 hit 10%? Surely some of those people who wanted to quit, would have actually gone ahead and done so as the situation gradually improved over time. 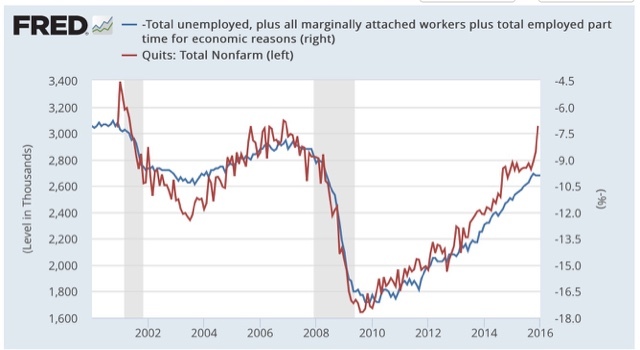 For every level of underemployment over the last 3 years or so, there have been more Quits than occurred during the last cycle -- just what my hypothesis predicted if there were "pent up demand." So the bottom line is, while the report is still consistent with a maturing expansion, this was a very positive month.